Welcome to our very spacious Lakeview Guest Suite with kitchen. 2019 Nightly rates, one-two adults July and August: $145 (3 adults $190); May & June: $130 (3 adults $175) - plus 8% PST will apply as per B.C. Gov't. effective Oct. 1/18. 'Check Room Availability' above for open dates. Established in 2001. Guest Suite accommodates a maximum of three adults (no children). Two Night Minimum Stay. 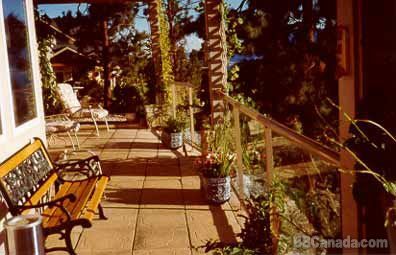 We are open year round, inquire for low season rates from November through May. Your privacy is our priority. Large Daylight Guest Suite with private garden entrance. Fully self-contained kitchen, flat screen T.V., Wireless Internet, A.C., 38 ft. covered deck with BBQ. Washer/dryer for longer stays. Full bathroom with toiletries. Guest Suite is bright, spacious with large view windows and high ceilings. 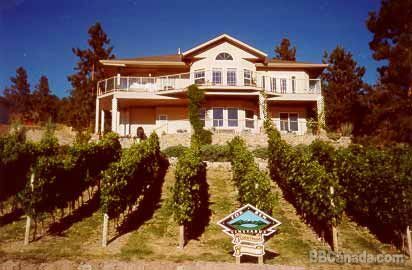 Living room and kitchen overlooks panoramic views of Okanagan Lake, our Merlot vineyard & lush valley orchards. One Queen Bedroom & comfortable private Den with single bed. The independence of Self-Catering holidays 'With Foods You Choose To Bring', in the convenience of your fully equipped kitchen (complementary tea & coffee). 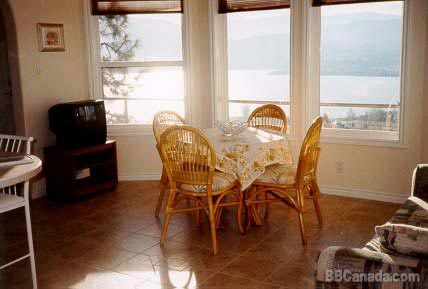 Marvel at the panoramic vistas of Okanagan Lake from Penticton to Peachland & Mountains beyond as seen from your large deck & from within the Suite. See Website 1 above, under Contact Information, for further information and photos. 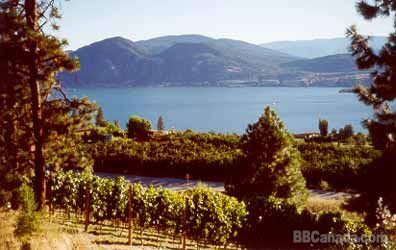 Close proximity to Penticton, Golfing, 40 Wineries, Trans Canada Trail/KVR, Naramata Village, Restaurant, Cafe, Naramata Pub & Grille, Manitou Park/Beach and much more. Check In/Check Out : Check In: 4-6 p.m. or by prior arrangement. Check Out: by 10:30 a.m. Cancellation : We do not request a deposit. Approximately a month before your arrival we will confirm dates and payment can be arranged. If your plans change prior to your booked dates, as a courtesy please advise us as soon as possible. Seasonal Information : We are open yearly.